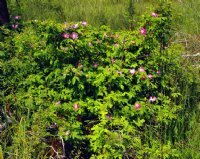 WOODS ROSE - a hardy, low to medium growing, thorny shrub which may reach a height of 3-5 feet. Growth form is upright to arching, roots sucker to form an open to dense thicket. Foliage is more refined than Hansen hedge rose. The single pink flowers are followed by red rose hips. Native throughout the central and northern Plains and Intermountain west. "